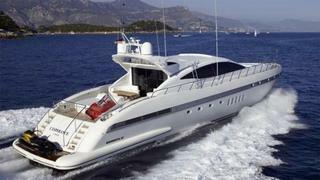 Clement Morelle at Gaspard Yachts tells me there’s a €1,200,000 price drop on the 28m Mangusta motor yacht L'Esperance. Designed by Stefano Righini, L’Esperance was built by Italy’s Overmarine yard in 2004 to RINA class and is MCA coded. Her tasteful interior has recently been further upgraded by new soft furnishings and features dark wenge flooring with white leather ceilings. The saloon has a bar, fridge and icemaker plus a formal dining area for 10 guests under a sliding roof. Accommodation is for seven guests in three staterooms. The full beam master suite amidships has a king size bed, large portholes and a walk-in wardrobe, while the VIP stateroom forward has a sofa and full marble en suite bathroom. The twin cabin features a Pullman berth and, like all the staterooms on this yacht, has a marble en suite. There are three separate sunbathing areas aboard this superyacht: one on the foredeck, one on the aft deck and a private area on the hard top. Twin 2,000hp MTU engines power L’Esperance to a cruising speed of 27 knots and top speed of 34 knots with a range of 400 nautical miles at 27 knots. L’Esperance is now down from €2,700,000 to €1,500,000.